To make these cookies even prettier, I also coat the edges with white chocolate and then decorate with pretty Christmas sprinkles. I got my small Christmas tree cookie cutters from eBay – they were just £1 for three! To ensure that the cookies don’t stick to the cutter, dip the cutter into the flour between each cookie. Assembling these cookies is so easy – simply cut large circular cookies out of the vanilla dough, and then use your Christmas tree cutter to cut a christmas tree shaped hole in the centre, into which you’ll pop a Christmas tree cut out of the green coloured dough. It’s actually incredibly easy – they just slot into each other, and once they bake, since the cookies expand, they’ll be completely one cookie! The thing I love most about these cookies is that the fun cut out idea saves you from doing any fancy and time consuming cookie decorating royal icing (like the cookies below) which are from my Pinterest board. Don’t get me wrong, I absolutely LOVE the way they look, but these cookies are so much easier and more fun to make. First, make the biscuit dough. Combine your butter, which needs to be incredibly soft, with the sugar in a large bowl. Beat in the two eggs along with the vanilla bean paste, and then sift in the flour and mix with a large spatula - the dough will be quite stiff, but keep going until its all incorporated. Divide the dough into two equal portions, and then pop half onto some clingfilm and wrap it up tightly and put it into the fridge. Next, add about a third of a teaspoon of gel food colouring to the remaining dough, and knead until it's completely incorporated. It will go streaky at first, but carry on and add more gel if necessary if the dough isn't green enough. If its sticky, dust it with a little extra flour. Once it's a nice Christmas green, pop it onto some clingfilm too and then wrap it up and let it rest in the fridge for 20 minutes. Next, prepare three large cookie sheets with non stick baking mat or parchment paper, and preheat your oven to 160c/gas mark 4/350F. Roll out your two doughs on a liberally floured work surface. 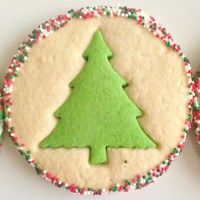 Use a large circular cutter to cut out circles that will easily accommodate the size of Christmas tree cutter you're using, and transfer these to your cookie sheets. Next, cut out a christmas tree shape in the centre of each circle. Perform the same step with the green dough, and use a palette knife or spatula to pick up and transfer the green trees into the vanilla dough and vice versa. Bake for 10-14 minutes, and keep a close eye on them and remove from the oven or swap to a lower shelf if they're starting to get browned (generally if they are starting to get browned, they will be done). Let cool completely on a cooling rack. If you'd like to decorate with sprinkles, melt your white chocolate in the microwave (I use a mug for such a small amount, and microwave on 15 second intervals and stir well). Use a teaspoon to drizzle white chocolate over the biscuits, or to smear onto the outside of the cookies, and then add on sprinkles.